May her mountains be beautiful! …and so the journey continues; climbing mountains, falling off cliffs, reaching for the stars. Abbigail’s bone scan last week returned positive. The bony structure within the right ala of her pelvis lit up like a Christmas tree, correlating precisely with what was seen on her MRI images of July 15th (see recent posts since MRI). What does it mean? It means just that. Nothing more, nothing less. It barely moves us forward at all. But it’s official, I am now pronouncing it so. Abbigail is an enigma. The truth, of course, is that neuroblastoma is such a complex, multi-dimensional disease that there are children like Abbigail for whom modern medicine just doesn’t have any answers at present. Relatively speaking there is so much that is still unknown about what neuroblastoma really is, and how/why it behaves like it does. With these results though, the ‘plan’ has an additional, hitherto unmentioned, element; a core biopsy. She’s had pretty much every scan and diagnostic test going, and has gone through multiple biopsies and aspirations in the past, I’m sure she’ll hardly noticed if we slip one more into the schedule. So, I sit here alone, on a cold couch, in the dark waiting. Waiting for something to wake me, to end this scary road and show me the light again to a place where our daughter no longer feels pains from needles, chemos and cancers, where she can ride a bike and fall off, skinning her knees for band aids instead. Waiting for my heart to mend after it’s been broken too many times over. Waiting for the fear to stop invading my every thought and decision. Waiting to hear someone say she’s free. I’m waiting to hold my daughter as she wakes from her sedation today. She went in for her biopsy a couple hours ago, with a smile on her face as she fell asleep in my arms. She will wake hopefully and the interventional radiologist will come out confident he retrieved enough bone and marrow to provide answers and that our baby girl was unscathed through the procedure. The wait won’t be over though, not for us as her parents, family and team of doctors. Then we wait for results from the lab. Agonizing at best. Gut wrenching most hours, soothed by her laughter and the love she has for life but nonetheless painful and frightening. We pray it will come back negetive, proving once again that Abbigail doesn’t follow the norm or any precedents…we pray for the day when there is a small amount of certainty again in where we are headed with her treatments. Please keep Abbigail in your thoughts and I know how much love is here for her! Let’s show her that love and share her beautiful smile with the world. One final thing that is definitely worth mentioning, and that to my discredit I could easily have omitted. The medical teams who have worked closely with Abbigail over the last two and a half years at the Children’s Hospital of Eastern Ontario have been incredibly supportive of what we are trying to do in terms of getting the absolute best treatment for Abbigail. At various points over the last few weeks and months the simplest option by far would’ve been to turn around and ‘encourage’ us to take Abbigail elsewhere. Instead, her oncology team, and in main part her oncologist, has remained very active, talking to doctors in other cities, provinces and countries, facilitating the various additional procedures needed for her OMS away from home, working day and night to find the answers that aren’t always there. My feeling is very much that at the end of this period we will know as much as we ever could about what is going on inside Abbigail. The unfortunate thing is despite everything we have done, and are doing, there’s still not actually very much we can say for sure, and the future remains as uncertain as ever. Of course there have been times when I haven’t been completely happy with her care; I was recently very frustrated over the hospital’s “slow down” policy and the resulting difficulties arranging her scans and biopsies for this possible “relapse” and I’ve challenged the doctors, offered opinions, made suggestions, and asked some difficult questions (plus a fair few stupid ones as well). And at no time have I heard discouraging noises, or felt like I was being talked down to, or told what to do. It’s a very welcome contrast to some of the stories that I’ve heard from other parents going through this rare journey with OMS and neuroblastoma. Maybe I’ve just been lucky, maybe sometimes I see through rose-tinted spectacles, or maybe the times they are a-changin’. I believe in my heart that Abbigail’s team loves her, from her oncologist and case manager, to the team in radiology who have seen her and cared for her more than 100 times all the way to the nurses in MDU and the administration who are first to greet her everyday. They all have a special place for her in their heart and that is irreplaceable and priceless. Abbigail you will never climb alone and once we get you to the top you will hold the stars in your hands and shine among the brightest. I believe! So many of you that have been closely and wholeheartedly following already know that Abbigail had an MRI last week that was supposed to simply show stability within her little body and her liver tumour. Instead we face more heartbreak, frustration and fear as it showed concerning and suspicious new activity within the marrow of her pelvis. Quickly an MIBG scan was scheduled, the radioactive iodine-123 was ordered and our worries heightened, stomachs turned and hearts sank AGAIN as we waited…waited for the scan itself And then waited for results. Well, the MIBG report came back clear with no abnormal uptake of the radiotracer was detected anywhere. But what does that really mean? And how does it affect our thinking and plans going forward? The first thing to say is it didn’t entirely surprise me that the scan came back “clear.” Her last tumour (still present within her liver) investigated by MIBG didn’t positively light up on screen with MIBG uptake either. Today’s report is definitely a positive result, the best we could have hoped for; but at the same time (unfortunately) it’s neither remarkable nor game-changing. We still have these MRI images showing metastastic action in her pelvis, her liver is still home to a lesion and her body hasn’t been performing or acting in a way that would mirror a healthy child – something isn’t right and I promised my baby girl 2.5 years ago that I would never doubt my instincts again. To help you understand our concern still, I will quickly explain that one of the many scans that Abbigail has been having regularly for the past 2.5 years is called an MIBG scan (meta-iodobenzylguanidine). This substance is usually picked up by receptors on the surface of neuroblastoma cells. For scanning purposes it has a radioactive tracer attached to it (usually radioiodine I-123) that can be detected by imaging equipment. It is probably the most specific, most accurate and most widely used of all diagnostic techniques for detecting neuroblastoma. Of course, like almost everything else it’s not infallible. Some children present with non-MIBG avid disease, or their neuroblastoma mutates to become such. Abbigail’s primary tumour, discovered within her left adrenal gland in February 2012, was MIBG-avid, however her liver lesion, discovered in February 2013, a full year post frontline treatment, was surprisingly not MIBG-avid, such as this recent highly suspicious sacral bright spot within her pelvis, which means perhaps Abbigail’s recent tumours are among the rare 10% of neuroblastomas that do not pick up the MIBG substance. Does this mean that her cancer has mutated? Is her neuroblastoma changing over the years? Abbigail still has a lot of disease, her liver and pelvis are riddled with lesions and abnormal cells, as evidenced by various multiple scans. However, there is currently little evidence to show the activity within her pelvis, as evidenced by her recent MIBG scan. So now what? Do we allow a biopsy, PET scan or further treatment? The result of Tuesday’s MIBG scan is good I guess, but mainly because it would have been worse if there had been significant uptake on it, but as it stands, we can still hope and pray that this monster isn’t hiding elsewhere and until we investigate further nothing or no one can take that hope from us. I said earlier that I wasn’t surprised by the latest scan results. Although I didn’t necessarily expect the scan to be completely clear, I didn’t expect there to be significant uptake either (although it’s always impossible not to worry that something nasty is going to show up). My thinking was that Abbigail has had stable disease for the best part of SIX months now. If she’s got stable disease, it either means treatment has holding it at bay, or the cancer itself hasn’t been doing a whole lot. Reflecting on what treatments she’s had in the last couple years, I think her disease was in some form of hibernation. Maybe the multiple chemotherapies she had last year did enough to either slow the progression, maybe even stop the dividing of her liver tumour NB cells, but not enough to destroy any persistent undetected cells – Abbigail’s scan results aren’t consistent with responses that have been seen in some other children. We can only speculate because we can not monitor if they are not MIBG-avid, so at what point did her disease first became active again will forever remain a mystery, maybe it was never inactive at all and she has been fighting inside since that dark day in February 2012. I’d love to believe that her NB has all matured, that the cells have divided as many times as they are going to divide, and that things are now just going to remain in this state, with no further surprises or undetected cells. But truthfully, deep-down inside, I don’t believe that for one minute. Maybe one day…but not today! Even if I did believe it, consider this; the majority of children with neuroblastoma do achieve a first remission, their scans show no evidence of disease (NED), and yet of these children somewhere between 40% and 60% go on to relapse, the neuroblastoma comes back. Despite all the intense, destructive, super-toxic, treatments these children are given, residual disease still remains at the end of it. Too small to be detected using current imaging techniques, even the most neuroblastoma specific, the MIBG scan. Yet eventually this residual disease grows and multiplies to become a full-blown observable tumour, and relapse happens. If a child who shows NED has minimal residual disease that can’t be seen, in my own mind I have already decided that Abbigail has other areas of disease, not showing on any of her scans, but which nonetheless are active and which will, given time, result in new tumours forming. So we have to think about this, as well as what does currently show up on her scans today; the pelvis and liver disease. It’s why we put her through chemotherapy and soon a treacherous transplant. It’s why we are considering all sorts of treatments, such as cis-retinoic acid, a super high-dose of a vitamin A derivative, which has been shown to cause differentiation in neuroblastoma cells, turning them into mature cells that will no longer sub-divide. It’s why we’ve extensively researched our next move. Seeking at possibly getting Abbigail some form of immunotherapy, the antibody treatment that has proved to be a major breakthrough in the fight to prevent relapse in neuroblastoma patients. We know the harsh reality of this type of cancer, we understand the odds and despite all of our hope and faith, we can’t ignore what is right in front of us! Abbigail will be back at the CHEO for her OMS treatment this week, at which point we will discuss in depth with her oncologist about our next investigative approach and possible treatments. Her amazing team at CHEO will be in discussion this week, so please pray they have answers for us. Until then, together we will face our reality here and continue on living life! All the while holding our breath, but never losing hope! And so there you have it. I know my updates are becoming ever more complicated…but then so is the situation we find ourselves in. Thank you for reading, sharing and praying as we struggle through this unpaved path. After you’ve heard those words; “your daughter has cancer,” there are many ways it can go and there is really no way to know for sure…this becomes clearer over time. Diagnosis, active treatment, end of treatment, cancer comes back (recurrence), active treatment again, possible survivorship with ongoing treatment and life-long sequelae, secondary cancers caused by the treatments that saved their life initially or an other recurrence and the cycle starts again and again with very little light some days. With cancer, all sorts of things can change at any time, for better or for worse. While it would be great to know what to expect, there is no way to predict how anyone will do. 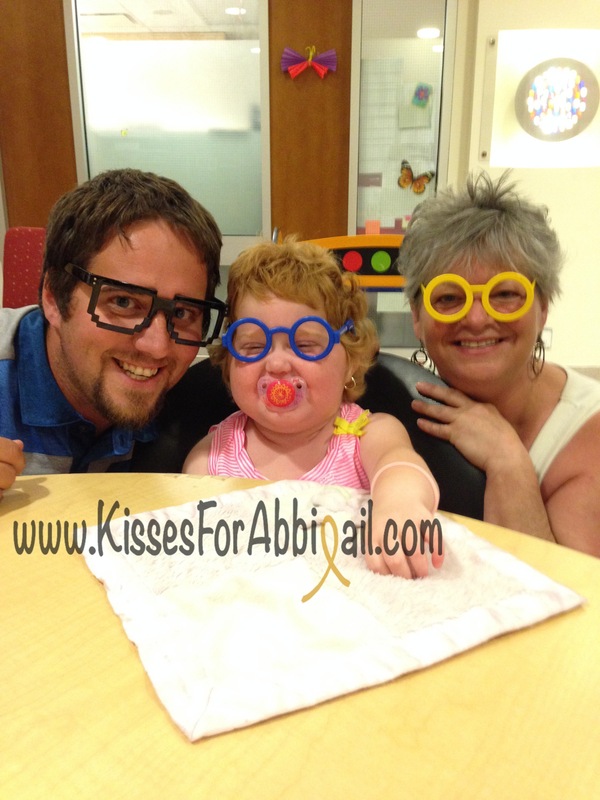 Tuesday Abbigail shared her radiant personality with her MRI nurses for the umpteenth time. This was her regularly scheduled scan to check her abdomen and pelvis to see how her liver tumour is. Last night we received the much anticipated call from her oncologist to let us know the results. We knew the tumour would still be there, but what we were praying for was it’s stability and those prayers were answered. Her liver lesion continues to stay stable with little to no growth or spread. As I received this news, driving with three kids behind me in their seats, I couldn’t help but hear pitty, sadness and disbelief on the other end as she said my name. She explained that the radiologist reported suspicion of metastasized neuroblastoma within the bone marrow of her pelvis. We used to worry about a possible relapse of her cancer, then it did return. Now we may never read an other report that says Abbigail is NED (no evidence of disease) but we come as close as we can each time they scan and report that her liver tumour remains stable. Last night our “normal” changed again. Today I had to kiss my kids goodbye and tell my baby girl, that for the first time since diagnosis, Mama wouldn’t be there to hold her hand while she got her bloodwork done. I returned to work and it turns out it was harder today on me than on her thankfully. Next week will prove to be much more difficult than I could have ever imagined my return to work being. Due to the recent news of this suspicious lesion in her pelvis area, Abbigail will have to face her biggest fear at CHEO. She will have to do it without Mama for the very first time. This two-day procedure that will be performed next week, called an MIBG scan, involves injecting radioactive dye into her body, which will then be scanned 24hrs later to view any neuroblastoma that may be active in her little body. I walked the halls at work today with one of those “everything is fine” smiles when in reality my world was crumbling before me once again. My baby girl may have to face the innocence robbing disease that childhood cancer is once again and I am petrified at what it will do to her. Mentally I wasn’t at work, I was in a hospital isolation room watching my baby be infused with life saving poison again and I could not understand why life has put me in this office chair and not by her side. I can’t count how many times today I was asked how I do it? And I heard countless times that “I am strong and amazing.” They want to know how we are all doing, especially Abbigail. It is difficult to relive the daily pain so publicly but honestly if you ask, I’m not strong, or remarkable…I’m a mom. I’m angry. Furious. I have never been so mad in my life at anything as I am at cancer. It messed with the wrong family this time. I recount her journey countless times as I run into people I haven’t seen in a while or others who recognize me and want to know more than the words I share online. I share intimate photos of Abbigail publicly. I open up our journey to strangers. I publicly journal my feelings as a mother who is experiencing the agonizing and ruthless pain cancer inflicted on my baby. No matter how raw and unpolished my words, feelings or photos are at times, I want the world to know who my beautiful Abbigail is; strong, brave, fierce, so loving and one of a kind! These reasons are why I appear strong, and why I share the worst days of my life so publicly. I have become a different person since February 2012 when I was introduced to the world of childhood cancer in the worst possible way but I never want Abbigail to see anything less than what I pray for and hope for each and every time I beg for mercy. Today I was weak, I cried driving to work, I laughed at jokes I didn’t hear because my mind was clouded with fears for my daughters future…her life. Today I was not brave, I wasn’t strong, but that will not keep me from striving for better tomorrow as I pull away from my waving babies. I must always think positive, never give up hope, praise my children on any sign of improvement, and most importantly of all, never let Abbigail or the boys see me give up. I have become Abby’s crutch during this journey and she will react to my feelings and fears but will also react to my positive thinking. So tomorrow I will report to work, I will support my husband as he holds our daughter through her fears for the first time alone and I will continue to pray and have faith that Abbigail’s fate extends beyond cancer because after you’ve heard “those words,” your world is never the same again and you realize that the control you once thought you had, never really existed.